We all like eating out with our friends and family. Steaming plates full of whatever food you request are served directly to you, no cooking or washing up is required, and good conversations flow alongside several glasses of wine. Problematically though, there would have been a lot of perfectly edible food that didn’t quite make the cut for the standards of your meal. We know there is a problem with food waste in this world. Globally, we throw out a third of all edible food that is produced, and most of that is before it even reaches consumers. The problem then, is this. There is only so much we can do as individuals in this battle. What can we do when the supermarket has 300 strawberries they didn’t sell that day? Buy all of them at discount? The baker isn’t going to send us a text that there is an overabundance of baguettes (although that would be great). There has to be a system in place that is more coordinated. A simple yet beautiful solution is to bring all that food together at the heart of the community. The baker sends in the baguettes, the supermarket sends in their nearly-turned avocados, and bam, guacamole on toast for all. This sounds very hard to organise, but there are thousands of people around the world working to make this process easier. Getting literal tonnes of food to one location on one night to feed hundreds of people is now a feasible concept thanks to technology. You can search Apple and Android stores to find any number of ‘food savers’ apps. Supermarkets work with enterprises to ensure their food is sent somewhere useful. France (admittedly symbolically) made food waste from supermarkets illegal, and enforced compulsory partnering with donation centres. You can even donate your own surplus food. Volunteers may pick up the food, or you may have to drop it off at a centre, but the point is, no more excuses. Amsterdam, being Amsterdam, has many of these initiatives. We were spoilt for choice, but we went to check out Taste Before You Waste. It is a community kitchen that provides educational events, and even outside catering with food that is donated. They also provide ‘wasteless dinners’ where twice a week, they cook for the community. Treated like the queens they are, the Ginger and the Vegan were served a starter, a main, and a dessert on their adventure into food waste land. Admittedly, some of the vegetables were not immediately identifiable by either ourselves or the cooks, but they tasted great. To see Taste Before You Waste in the flesh is really cool. They have a stall with all the excess food they didn’t cook, so the food gets recycled twice (we took many a bread roll home to pair with our homemade hummus). The complication with these projects comes with the payment- it’s pay as you feel, which is great. Obviously donations are necessary. If this is to become the norm all around the world, we need to decide on a scalable business model. Is food waste reduction a for profit, social, or charitable enterprise? Taste Before You Waste was tasty, and stopped the wastey. We look forward to seeing how these initiatives expand across countries. 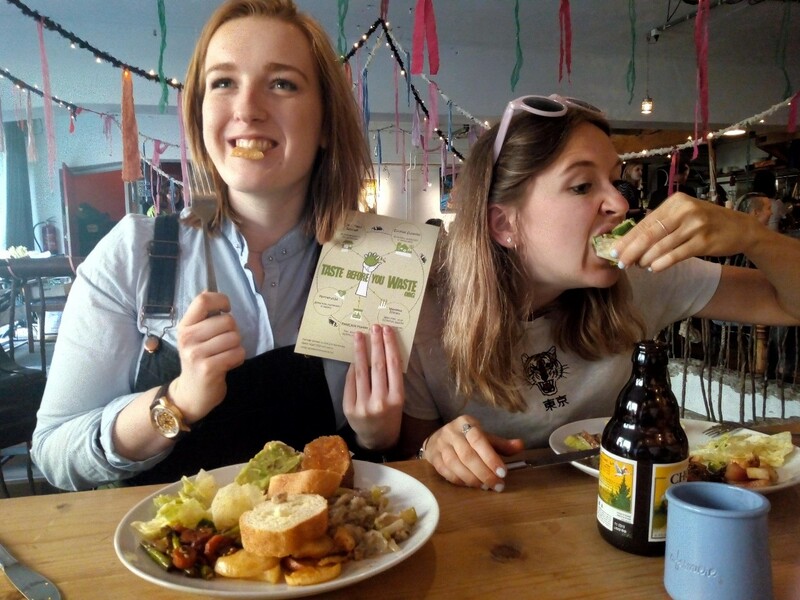 Check out events in your local area to see what’s occurring (Facebook is a good place to start) and make your meal out with your mates a wasteless wonder. When Morgana returns to Birmingham she’ll definitely be checking out their food waste scene, and if there’s nothing about, maybe think about starting a little something of her own.